That is a great shot! I love the old books and the owl! That table is wonderful! Beautiful shot, I love the dried flowers. Love the composition (and old books). LOVE the books! great angle - great shot! Beautiful picture! I love everything about it, especially the dried flowers (or herbs?). What a lovely shot! Is it yours? If so, are the books yours too? Sorry if I am being nosy. Meg- It's lavender so herbs, I think. Iris- Yes, I took it (new camera). The books are mine too. The French ones were textbooks my Mother-in-law let me have. The blue one I bought at a used book store. Very nice! 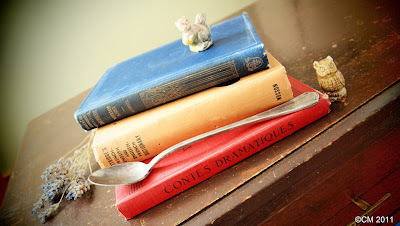 I love those little figurines - are they the same ones that used to be in tea boxes years ago? I love old books, just the smell and feel of them. If only they could talk, the stories they could tell. It's even better when they have a dedication or inscription inside them, then you can try to imagine what the reader was like, as well. Pretty! I love the color combination! Myckyee- Yes! They were in Red Rose tea boxes when I was a kid. Lovely books! What is your favorite one?